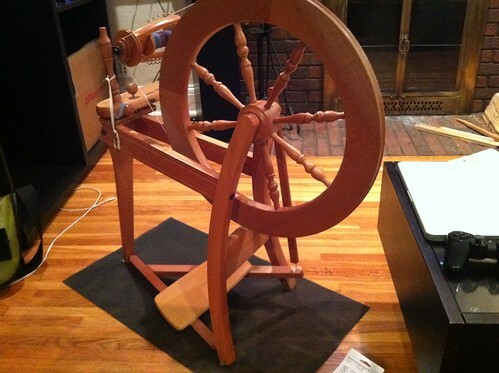 Spinning tricks: spinning wheel mat and drying handspun yarn. It’s a delightfully rainy and stormy day here in Duluth, MN. Chris is out of town working so I’m left to entertain myself. I wanted to get out of the house, so I’m at Dunn Bros enjoying a latte. Yum! I’ve been spinning this weekend, and wanted to share a couple of tricks that I use when I spin. It’s grippy contact paper from the kitchen cleaning aisle at Target. Another trick I thought I would share is how I weight the yarn when I dry it. I must be getting better at spinning, because my plied yarn seemed fairly balanced and not twisty this time, but I still hung it the way I usually do. I put one end of the wound skein around the top of a hanger. I used to put a soup can or other heavy can through the bottom loop, but recently have started hanging another hanger in the bottom to weight the skein. 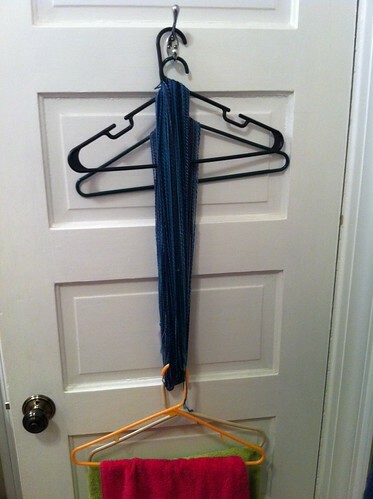 To make the hanger heavy enough, I put a folded towel on it. This way, the water that drips from the bottom of the skein drips onto the towel instead of the floor as it dries. Gru is getting along just wonderfully at our house, and we couldn’t have asked for a better dog. The other night, when I went to Target to get my spinning wheel mat material, I brought Gru. Little did I know, I was driving straight into a thunderstorm. I could see it in the distance when I parked the car, and by the time I got out of the store it was right over us. I came back to no dog in the back of my wagon – he’d climbed over the seats and was huddled in a ball in the driver’s seat! He’s afraid of thunder, lightning, and, by association, camera flashes. When Chris is gone, Gru sleeps on the bed with me, and he woke me up with a nose in the face this morning to let me know there was more thunder. Every time there was a boom or a flash, he paced nervously around the bed. Finally, in search of a small space to curl up in, he jumped from the bed to the top of his kennel. I had to pick him up and put him back on the bed, and I finally got him to lay down by petting him. He’s gotten better about storms since we first discovered his fear. 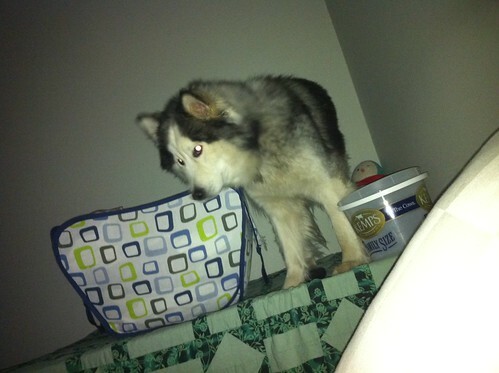 The first time we figured it out was because he woke us up by scrabbling under the bed. Now, he comes to us to be comforted, and will just lay on the floor as close to us as possible while making sad faces. « One sock done, second started.